So what causes voids under foundations and concrete surfaces? 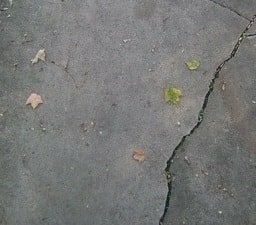 Most cracks are caused by soil shrinkage, frost heave, fluctuating temperatures, or soil erosion. If left untreated, cracks can widen and result in water seepage. The soil may also shift and move, compromising the home's structure. If you notice cracks or an uneven foundation, our professionals can assess your property. We specialize in concrete leveling for concrete and foundations. We can lift your foundation back to normal, so you can avoid concrete replacement. We'll save you time and money, while providing a safe environment for pedestrians and your family. At Jerry's Waterproofing, we use the latest underpinning products in the underpinning industry by Earth Contact Products (ECP). ECP is the preferred manufacturer of foundation repair products in the industry. Our experts can install helical piers or steel push piers to repair settling foundations. For shifting or moving foundations, we use helical tiebacks or plate anchors. 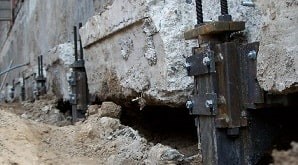 These two methods are designed to straighten and stabilize the foundation wall back to normal. If you suspect voids under your foundation, look for signs of foundation settlement. We'll help restore your foundation and concrete back to normal. We also offer waterproofing to keep away future foundation issues. Contact us today to get more information or to request a free estimate in Omaha, Nebraska and the surrounding areas.